No aurora visible last night (lat 41 deg), but Moon was very bright. 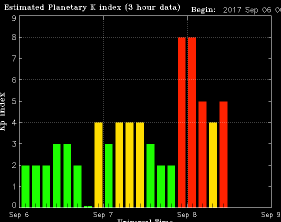 Kp (Planetary K index) is supposed to be 5 now (quite high), and it was up to 8 last night. But the 20 meter ham band is hopping. I just bagged my first digital T77 (San Marino). If it weren't for the news, I'd say 20 meter (14 MHz) conditions are fairly normal, but 15 and 17 meters (21 and 18 MHz) are largely dead. Sometimes it's better not to know too much. End of the world, coming into view?